The crew of Yacht of the Year, Little Blue. George Yorke, Jenny Worsfield, Tim Worsfield, Dawn Austin and George Bliss. Lovers of sailing gathered at a prize-giving dinner to celebrate a successful summer and raise money for charity. Sussex Yacht Club in Shoreham and Sussex Sailability celebrated plenty of individual and group achievements at the club’s biggest event of the year. Many coveted prizes were awarded throughout the evening, one of which was Yacht of the Year which went to Little Blue. Little Blue took part in more than 20 races throughout the year, which led to crew members George Yorke, Jenny Worsfield, Tim Worsfield, Dawn Austin and George Bliss proudly accepting the award. Tim, the skipper of the 34-foot cruiser racer, was delighted. He said: “I feel so proud of everyone, they have been brilliant, they really are a top crew. The club managed to raise more than £300 for the Shoreham Harbour Lifeboat Station during the evening. Terry Kinch, commodore of Sussex Yacht Club, said: “This is our biggest event of the year, it is our chance to reflect on another year of fantastic sailing in one of the best locations along the south coast, while thinking forward to 2019. Sailability was founded by the Royal Yachting Association to enable disabled people to take part in sailing. 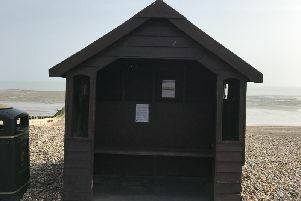 With the aid of a National Lottery Grant, the Sussex Yacht Club premises at Shoreham have been modified for disability access. Hoists have been installed on the jetties to lift sailors to and from their wheelchairs. The charity has 15 boats suitable for people with disabilities to helm and to crew. Terry said: “We all love the freedom of sailing and we want many more people to be able to enjoy the sport as independently as possible. Sussex Yacht Club’s main clubhouse is located in Brighton Road, Shoreham. For more information about the club, visit www.sussexyachtclub.org.uk.